Destinations International is about serving destination marketing professionals first and foremost. We inform, connect, inspire and educate our members to drive destination development, community sustainability, qualify of life and economic impact through travel. Benefits listed below extend to all staff of member destination organizations, regardless of size or type of membership. Destinations International is a hub connecting associations and industries to create trusted partnerships invaluable to our members. 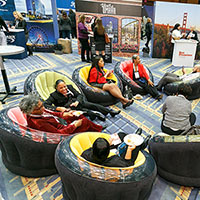 Connections to over 5,600 industry professionals at over 650 destination organizations, business members and corporate partners. This includes access to the searchable Membership Directory, partner offers, and one-on-one interaction at Destinations International Summits and events. 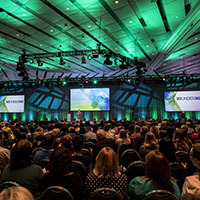 Receive weekly industry updates, quarterly newsletters, NewsBriefs, Meetings and Convention Industry Insights, blog posts and the industry Career Center. Ask questions and get help with your pressing issues on the Member Forum. 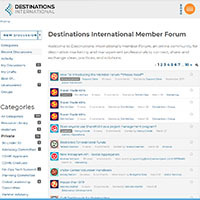 Access to the Member Forum is restricted to members only, giving you the ability to offer and exchange advice with other destination professionals around the world. The Destination Marketing Accredication Program is the industry's highest certification for destination organizations. 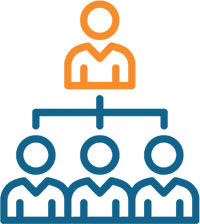 DMAP certification includes a unique community of peers who have all completed the same rigorous process and can provide unique insights and best practices. Access over 185,000 meeting histories on the industry's oldest and most comprehensive community-driven database, MINT+. 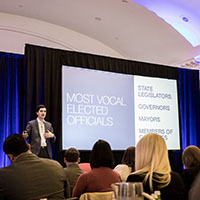 Destinations International is the collective voice of destination organizations empowering destinations on issues big and small. Through the Destinations International Foundation, we provide investment in issue tracking and listening tools to allow proactive monitoring to tackle governance and political challenges on a local level. 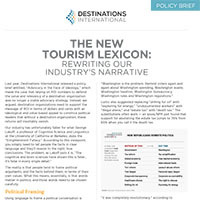 Explore research reports and supporting materials published by Destinations International's partners and industry collaborators to help advocate for your destination. Members have the ability to apply to join a committee, task force, or the Destinations International Board of Directors. It's the fastest way to have a direct say impacting the future of the destination marketing and management industry as a whole. 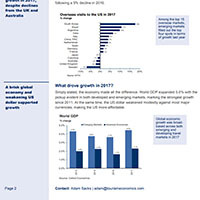 Download the latest policy briefs and threat analyses exploring critical and timely topics directly affecting travel and destination organizations. 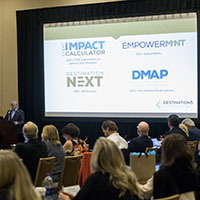 Destinations International is obsessed with what's next for destination management through forward-focused research and relevant data. Destination organizations and CVBs are acutely aware of the need to quantify the economic importance of events to their destinations. By using the Event Impact Calculator, industry stakeholders are empowered to make a strong case for continued investment. DestinationNEXT provides destination organizations with practical actions and strategies for sustainable success in a dramatically changing world. Since 2015, more than 300 destinations from 18 counties have utilized DestinationNEXT to strategically assess their destinations. According to research by Tourism Economics, one out every three room nights are booked outside the contracted room block. 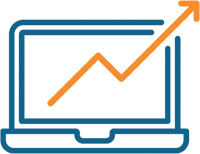 Gain a more accurate understanding of actual room demand with a dynamic tool, the Overnight Room Demand Analyzer (ORDA). The Compensation and Benefits Study allows Destinations International members to view and analyze compensation and benefits practices by destination organizations by size, geography, department and position. 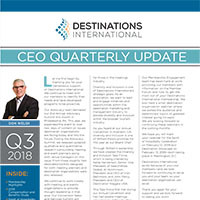 The Organizational & Financial Profile allows Destinations International members to view and analyze destination organization structures, practices, trends and developments in key areas of interest for the industry. Destinations International is the definitive resource for professional development and destination management. 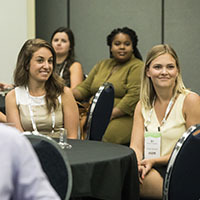 As the premier event for destination professionals, Destinations International's Annual Convention provides a unique opportunity for destination organizations to connect with and learn from peers and thought leaders from inside and outside the industry. Join over 1,600 colleagues for this annual event held every July. Join your peers for networking and educational opportunities geared toward your specific job functions. 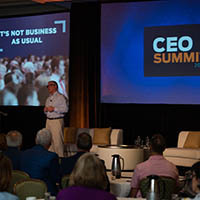 Summits include CEO; CMO; Visitor Services; Finance, Operations & Technology; Membership; and Convention Sales & Services. Get monthly education without the time and expense of leaving the office. 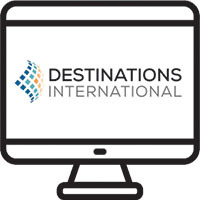 Destinations International offers several webinars geared for specific marketing segments, including small-market members, large-market members, and everything in-between. Geared towards professionals with less than three years of experience, the PDM certificate provides destination professionals with cutting-edge education and the skills and knowledge critical to successful destination management and marketing. The Certified Destination Management Executive (CDME) is the tourism industry's highest individual educational achievement. The program prepares senior executives to blend theory with experience and application of knowledge to help them thrive in a constantly changing environment. The program focus is on vision, leadership, productivity and implementing business strategies. Each year, Destinations International selects 30 rising stars under the age of 30 to gain increased networking and leadership opportunities. All employees under the age of 30 of member organizations have an exclusive opportunity to apply for this scholarship program. Answer a few quick questions and learn more about how membership in Destinations International can benefit you and your organization. How long have you worked in the CVB industry? What is the total operating budget for your organization? error_outline Please complete all fields.